Meike Kroger takes a break during the women's high jump competition at the 2009 World Athletics Championships at the Olympic stadium in Berlin. 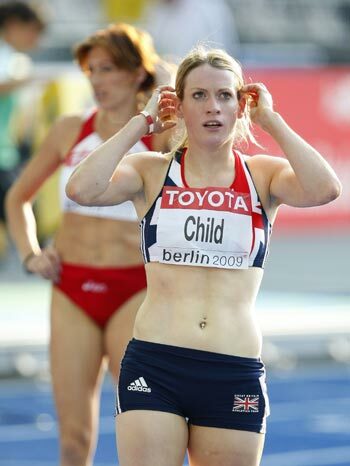 The beautiful women's pole vault champion won gold at the 2004 and 2008 Olympics, and the 2005 and 2007 world championships as well as countless European and indoor titles. In Berlin she failed to clear 4.80 metres and looked sluggish in all her three attempts. 'I have no proper explanation of what happened, she said without her usual sunrise smile, unusually tearful. 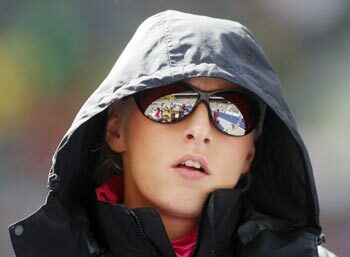 Yelena Isinbayeva was not the only startlingly attractive competitor in the women's pole vault. This year's champion, Anna Rogowska, matched her Russian rival in skill and the good looks department. Defeating Yelena for the second time in two months -- Anna also beat her at the London Grand Prix last month -- the Beijing Olympics bronze medalist claimed her first world title in Berlin with a clearance of 4.75 metres. The triple-jumper, a gold medallist at the 2004 Athens Olympics and a silver medallist at Beijing, is no longer the best, finishing sixth in her event. 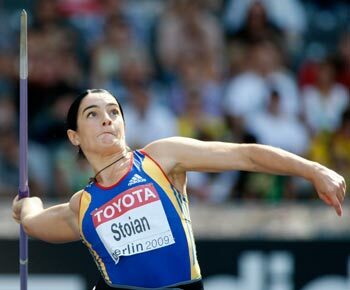 Tatyana won back-to-back gold medals in the event at the world championships in Edmonton (2001) and Paris (2003) besides winning the long jump gold at the last championships in Osaka (2007). If that is not fantastic, what is? The hurdler checks her time after a 400 metres hurdles second round heat in Berlin. Impressive feats are expected from the 22-year-old Scot who shaved half a second off her fastest-ever time winning her event at Loughborough University in May. The 24-year-old champion won the first medal at this year's championships, easily retaining the title she first won at the last world athletics event in Osaka. Olga, who is also the Olympics champion in her event, the women's 20-kilometre walk, took the lead after five kilometres. Thereafter, it was Olga, Olga, Olga all the way. Russian women have won the 20 km gold in five consecutive world championships. The javelin thrower reached her first major final in Berlin -- she had failed to do so at the Osaka world championships in 2007 and the Beijing Olympics last year. On Tuesday night, she achieved a personal best when she hurled the javelin 64.51 metres, but missed out on a bronze. Monica, who will turn 27 later this month, charmed the stadium with her grace, and, of course, that drop dead gorgeousness. The 25-year-old Bulgarian made a comeback to the big stage after a two year suspension. She had tested positive for testosterone in January 2007. Vania, a silver medallist in the 400 metres at the 2006 World Indoor Championships and a gold medallist at the 2006 European Championships, did not, however, make it to the Berlin final. The girl will be back. Russia's Antonina Krivoshapka, who made all the early running before fading, took bronze (in 49.71 secs) in the women's 400 metres. American Sanya Richards, third in Beijing after going into the 2008 Olympics as favourite, kept her discipline after Krivoshapka, a double-gold winner over the distance at the European Indoor Championships in Turin in March, had started strongly. The American took control coming into the final bend to win in 40.00 seconds, holding off both Jamaica's Olympic silver medallist Shericka Williams (49.32) and Krivoshapka.